Where are the Galapagos Islands? What are The Visitor Highlights? The Galapagos Islands are spread out over a small piece of the Pacific Ocean and are remote from any other land mass. They are part of the country of Ecuador, but have many of their own laws and regulations, mostly focused on conservation and preservation of the land, sea and wildlife. When you come here, you have decisions to make about where to go, how strenuous your trip should be and how long to stay. This post is meant to help you with these and many more questions. Here, I provide you with an overview of visitation to each of the Galapagos Islands, with some of their natural history and geography, along with the visitor site highlights of each Island. In addition, as I continue to blog about the Galapagos Islands, I will add links to detailed information about each site. As always, if you have questions, or you want more detail about anything mentioned in this article, please email me at blueattraction@hotmail.com. The video below, by Alex Hantke of Aquasurround is one of the most beautiful you will ever see of the magnificent wild life, bird life and marine life you can expect to see when you visit the Galapagos Islands. It is a perfect introduction. Click here to see more of Alex's videos. The Galapagos Islands are located about 600 miles off of the Pacific Coast of continental Ecuador. Though counted in different ways, they consist generally of 15 primary islands, 3-4 smaller islands and more than 100 rocks and islets. 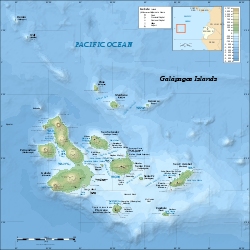 For a full over view of all of the Galapagos Islands Click Here. I saw giant turtles in Galapagos and explored its beautiful nature, and it was a wonderful experience for me, so I have complied fond memories of Ecuador travel in the form of photographs and videos.